Looking for somewhere to hike in southern Florida? The West Palm Beach, Fort Lauderdale and Homestead, Florida area have a variety of parks and reservations perfect for a day of hiking. 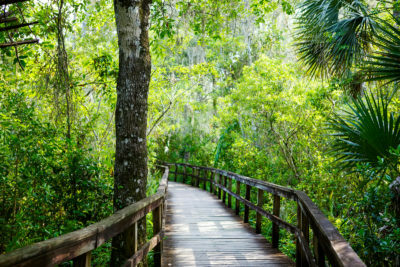 Check out this blog to find your favorite new southern Florida hiking spot! The Bill Keith Preserve is a nature preserve located in Broward County. This park takes up 3.4 acres and has a boardwalk, nature trail, canoe/kayak landing and an observation deck. This nature preserve was named after dedicated preservationist, Bill Keith. Hugh Taylor Birch State Park is described as Fort Lauderdale’s “Central Park” and is a great place for southern Florida residents to relax and exercise. The park has a beautiful picnic area with water and electricity available for rental. There is also a campground available for organized groups. This neighborhood passive park is 50 acres in total and has a shelter/meeting room, picnic tables, charcoal grills, hiking and equestrian trails. Fishing and boating are permitted in the park. The Apoxee Trail 2.5 miles of hiking and wildlife viewing. This trail winds through a restored wetland and pine flatwoods. The Apoxee Trail is a great place to view bobcat, white tailed deer, great horned owls and more. The SWA Greenway Trail System is a 300-acre wetlands conservation system that helps to filter water as it travels through Palm Beach Renewable Energy Park. This park has benches, bike racks, bird watching, hiking and more. The benches are made from recycled plastic lumber and the trail paths are made of recycled crushed concrete. The Anhinga Trail is a shorter trail that is highly popular due to its abundance of wildlife. Guests will often see alligators, herons, turtles, anhinga and more. Looking for Self Storage Facilities in Fort Lauderdale, West Palm Beach and Homestead, FL? Lighthouse Self Storage has storage facilities located all throughout southern Florida, in West Palm Beach, Homestead and Fort Lauderdale, FL. Our storage facilities offer a wide variety of features, including: boat, car and RV storage, climate controlled storage units, drive up loading and unloading and 5×5, 5×10 and 10×10 storage units. Reserve your storage unit today!